I will preface this by saying that this post is long overdue. 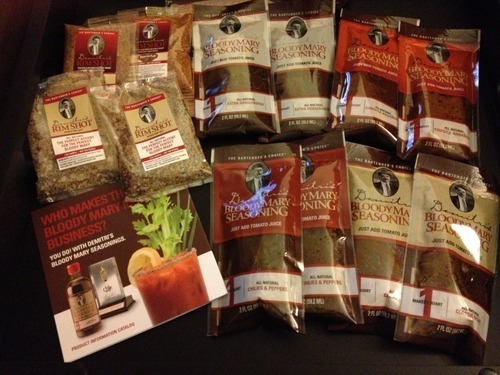 A few months ago, I received a box of goodies from Demitri’s, In general, Demitri’s sells their bloody mary mix and rimmers to hotels, bars, restaurants, nightclubs and grocery stores in all 50 states. That means, there is a good chance you’ve already sampled Demitri’s, but you may not even know it! They also sell direct to consumers online. 2 Ounce Pouch – Each pouch makes a quart of Bloody Mary mix when added to tomato juice, V8 or Clamato. 8 Ounce Bottles – We call this pack size The Traveler. Make one Bloody Mary at a time with enough Seasonings left over to marinate a few steaks…or make more Bloody Marys! 16 Ounce Bottles – Perfect for bar use ~ Flip-top dispenser and our squeezable, shatterproof PET bottle helps make individual drinks or batches perfect every time, in no time. 64 Ounce Jugs – High volume sports bars, golf tournaments and the morning after the bachelor party. Demetri’s was kind enough to send me a sampler pack containing (2) 2-oz pouches of each flavor, (1) 8-oz traveler of the original mix, plus (2) packages of two different rimshots (original & bacon). When the package arrived, I was very excited to start mixing my very own Bloodys, but several factors prevented me from doing so right away. First, I don’t make Bloodies at home all that often—usually, I would only be making them for myself and it’s rare that I would have all of the proper fixin’s on hand. If I’m going through all that trouble, why not just go out? Two, I had a couple other mixes I needed to review and that took me a while (see first, above). Three, when I was finally ready to try this out, I realized I didn’t have any tomato juice on hand to add it to! So, I bought some tomato juice and Clamato and kept it on hand for the next opportunity. That opportunity came on July 4 when we had about a dozen people over to our home prior to watching the local parade begin at 9am. I served french toast casserole, fruit, muffins and… Bloodys! I set up a build-your-own Bloody Bar in my backyard and whipped up two batches of Demitri’s: Original w/ Sacramento Tomato Juice and Chiles & Peppers w/ Clamato. Guests could choose their own vodka (Skyy or Rehorst) and then choose from fixings such as: pepperjack cheese, pickles, celery, olives, horseradish, beefsticks and of course, Benny’s Bloody Mary Beefstraws. Unfortunately, we were using plastic cups so the rimshots didn’t work as I had intended—I suppose we could have just used them as seasonings, but I saved them so that will need to be a post for another day! The original mix was zesty, a great blend of spices. People at the party commented on how smooth the taste was. However, since I like mine a little more spicy, I added a touch of horseradish and some pepper. I have yet to try the extra horseradish or the spicy habanero, but I have a feeling those will be yummy as well. Can’t wait to have another party and use the rest! Fans of Demitri’s can purchase the mixes and rimshots online, plus check out their store, wholesale options, their blog and community. I especially like the recipe options. In addition to making delicious drinks, the mix can make a great marinade or even be used with potatoes! Even though I don’t often make Bloodys at home for myself, I think I would have a lot of use for these mixes for cooking, too. I’ll have to try some of the recipes and blog about those as well.